This week: more data architecture! I'm a bit obsessed with data architecture at the moment. There is so much innovation in the space of data arch right now that it's hard to know which one to pick. Even the winners in the React space are still changing. For instance, redux clearly has the highest amount of mindshare, but it's still awkward to integrate with Relay. And something like Relay is clearly the future of intermediation between the client and the server. So, right now, it's really difficult to pick a side when everyone knows things are changing. Below we cover a few alternate ideas to flux/redux - the biggest contender seems to be some of the RxJS-based systems. (Though, personally, while I find observables to be powerful, I find the RxJS library to have a high mental overhead because of the large API surface area). Another source of inspiration is the Elm language and patterns. Redux itself was inspired by the Elm architecture, and there are still ideas from that community being ported back to ours. Below I've included a few Elm / React integration links that you might find useful. It's an exciting time to be a web developer! Side effects in Redux can be hard. redux-saga is an alternative side effect model for Redux apps. Instead of dispatching Thunks which get handled by the redux-thunk middleware, you create Sagas to gather all your Side Effects logic in a central place. At the moment, it seems like Flux/Redux are winning the data architecture mindshare, but Baobab is another popular approach to this issue. Baobab is an immutable data tree that supports cursors and it's inspired by Om's cursors. This library is a React integration for Baobab. cycle-react is another flux alternative that lets you use RxJS Observables for your data architecture. It's inspired by the Cycle.js library. exim is a lightweight Flux-like architecture. It's offered as an alternative to Redux. A neat feature is that the stores support async loading with optimistic updates. Async rendering & data-fetching for universal React applications. React Resolver lets you define data requirements per-component and then handles the nested, async rendering (on both client and server). This component allows you to easily integrate an Elm module into an existing React application. This can be useful to run some part of an application using Elm. If your React component's render function is "pure" (i.e. it renders the same result given the same props and state), you can use the PureRenderMixin for a performance boost in some cases. If you're using the immutable-js library then you can use react-immutable-render-mixin to get a similar performance boost. Realm is a mobile database, intended to be a replacement for SQLite & Core Data Realm mobile database. 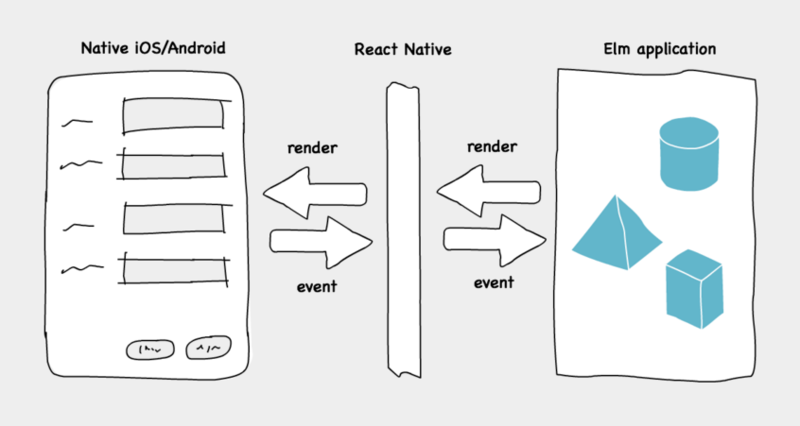 They've released a version built specifically for React Native. react-localstorage is an easy way to use localstorage in your apps. Curated with love by Nate Murray and the Fullstack.io team.